Today's card is for Ethan...He heads back to school next week and I always give him a little card in the morning before he leaves for school...You know, just a little something to remind him how much we love him and how proud we are of him. Really cute card. It looks like Ethan pulled it out of his pocket! Boys do that, you know! This is adorable and what a great idea! This is such a great idea. Ethan is going to love his card. Very cute! I love those stamps!! Love the way you distressed everything. Very thoughtful of you to do this for Ethan. Haha, that card is sooo boy! You can tell you have a son. Nice job Christina. Hard to believe that the kids are heading back to school already. Such a sweet gesture. I am sure he is going to love his card. Wow great card and so sweet to make for your son. She will need a scrapbook for all the cards his mom makes him. Thanks for the idea. How sweet away to brighten his day! Our schools have already been in session for about a month. We are haveing football games already. Sweet! Would also look cute on a paper brown snack bag or better yet, a Starbucks cup holder! You inspire me to try the great techniques that you use. 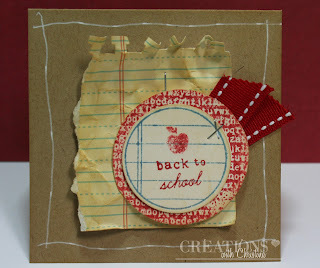 I had forgotten about the crumpled paper look but I like it and I really like the Tim Holtz inks also. Very cute and quick! Love the distressing. Ethan will love it! It's a fun card with some great techniques. What an adorable little card, great idea. Thanks for sharing with us how you clean your stamps !! Baby Wipes looks much easier than messing with Stamp Cleaner. I am really liking your idea and will try it for sure. Keep Up the Excellent Work, Eh !! (little Canadian joke) :-) Look forward to watching many more of your Videos !!! Christina, I am becoming such a fan of paper trey ink. Just wondered if you had tried any of their "My timeless templates"? They look really cute. I need your input.